Keerai thandu is a rich source of fiber and is very nutritious. You can use the tender stems of thandu keerai or mulai keerai (amaranth) for making this keerai thandu kootu. It goes very well with rice. I usually prefer simple and nutritious lunch. Our lunch on that day was lemon rasam, carrot potato curry, rice, keerai thandu kootu and curd. You can follow me on Instagram to get more lunch menu ideas. Today we will learn how to make keerai thandu kootu following this easy recipe with step wise pictures. Select tender stems for making this kootu. Wash keerai stems (thandu) and remove/string the fiber as you do for french beans. Chop it into 1 inch pieces as seen in the picture below. Pressure cook dal with 1/4 tsp of turmeric powder for 3 whistles or until soft and mushy. Mash it well. (Soak the dal for 15 minutes in hot water prior to cooking to save time and fuel). 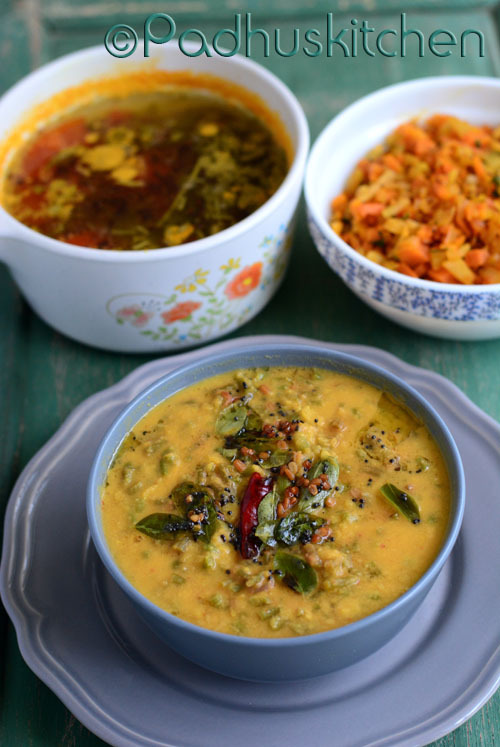 If you are new to cooking dal, refer how to cook dal. Heat 1/2 tsp of oil and saute urad dal, red chillies and rice. When dal turns golden brown, add grated coconut, saute for a few seconds and switch off the heat. Once it cools, grind it to a fine paste. Keep it aside. Cook chopped keerai stems in a cup of water with needed salt and 1/4 tsp turmeric powder until tender. Once it becomes soft, add the cooked dal and the ground paste along with 1/2 cup of water. Simmer and cook for 4-5 minutes. You may adjust the consistency of the kootu by adding more or less water. Check for salt. Heat a tsp of oil, add mustard seeds, when it splutters, add urad dal, red chillies and curry leaves. When dal turns golden brown, pour the seasoning over the kootu. Enjoy keerai thandu kootu with steamed rice or rasam rice. Hi can i use palak stem? If you can get thandu keerai, I recommend that first, otherwise you can use tender spinach stems.